Volkswagen Golf Cup season is heading for its finish and during this weekend we will know who is the third champion in one of the most prestigious cup’s organized in the Central Europe. The only Polish racing circuit is well-known even to foreign drivers, so the fight for success and glory will be amazingly fierce. The heat is even bigger thanks to the great weather, which is giving all the fans gathered in Przeźmierowo a bit of holiday sunshine. On the opening practice sessions during the beginning of the weekend, Dylan Pereira was the pace setters. 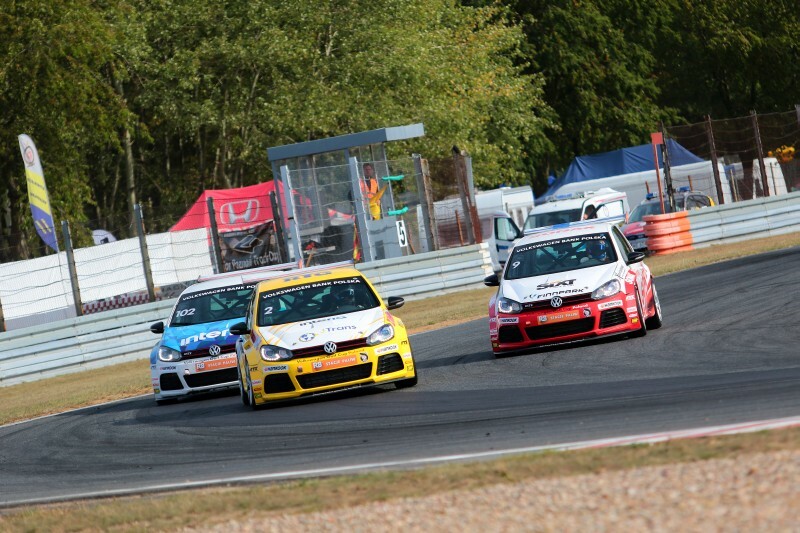 The weekend in the capital city of Wielkopolska is extremely busy and the first practice session began precisely at 10:00 a.m. Then as many as 25 Golf GTI’s roared their engines before the preparations to the last weekend of the season. However, the beginning wasn’t easy, as low morning temperatures meant the track was very slippery and getting the tires to their optimum work range was quite a challenge. Dylan Pereira was the one who managed the morning cold the best setting a lap time of 1:44,887 seconds, being the fastest on the Tor Poznań. The rest of the grid wasn’t far behind though, as Piotr Parys was only 0,091 seconds adrift, helding a good position before the fight for the unofficial title of the best debutant with Simo Muhonen. 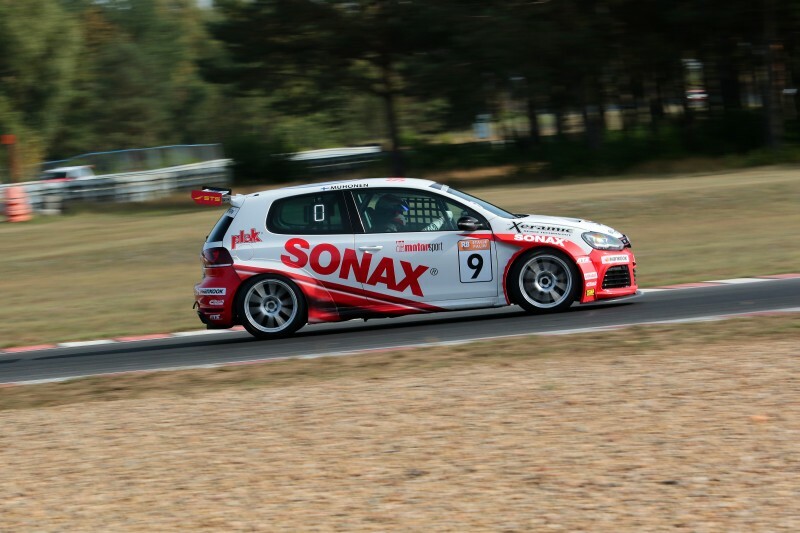 The last driver who finished in the top 3 was Andre Gies, who lost less then 0,1 of the second to the driver supported by Sonax. It is also worth mentioning that differences between the drivers were really small, which resulted with the top 11 finishers divided by less than a second. In this group we could see Simo Muhonen, who overtook 5th Jeffrey Kruger, Michał Gadomski, Marcin Jaros, Sebastian Arriola, Adam Rzepecki and Zbigniew Szwagierczak, who was the last finisher in the top 10. In the second free practice sessions it was once again Pereira, who turned out to be the fastest on the Polish circuit, improving his lap time from the morning session by 0,3 seconds. Other drivers, however, didn’t manage to repeat his achievement – most of them noted worse times then in the first session of the day, despite hotter weather and ability to do the flying lap since the very first stages of the 30-minute training. The second driver this time was Marcus Fluch, who lost to the competitor from Luxembourg 0,272 seconds. The last driver from the top 3 were Adam Rzepecki, in front of Bartosz Palusko and the leader of the overall standings – Jeffrey Kruger. Sixth time was yet one another great drive from Zbigniew Szwagierczak, the Guest driver, while the rest positions from the top 10 went to Jerzy Dudek, Andre Gies, Patryk Strzesak and Jędrzej Szcześniak. Drivers will have to face one more session today which will bring us the pole position winner before both Sunday races. We will know the pole-setter precisely at 3:35 p.m.
Adam Rzepecki: - The beginning of the weekend in Poznań was very good for me. The morning session was a tough one due to very low temperatures and the circuit was very slippery, but nevertheless I was able to do a quick lap. In the second free practice I found my optimal pace, which enabled me to finish 3rd. I hope in the qualifying session I will be able to run as good as I did here. Jeffrey Kruger: - I began the final round with 5th time in both sessions. I like the circuit in Poznań and I have already won here, but rivals are very fast too, so we will have a very fierce battle during the weekend. It is important not to make any mistakes and avoid losing important points. Dylan Pereira: - The weekend started very well. Two first times are a positive sign before the rest of this round. In the morning practice session we had some issues, but probably this was a result of the low temperatures. I hope during the next sessions we will be able to maintain the same pace.